TÂY NINH — Vietnam Dairy Products Joint Stock Company (Vinamilk) on Wednesday inaugurated a dairy farm with more than VNĐ1.2 trillion (US$52 million) of capital in the southern province of Tây Ninh. The farm – the largest of its kind in Việt Nam – covers 685ha in Long Khánh Commune, Bến Cầu District. With a herd of 8,000 cows, the farm provides 100,000 litres of fresh milk per day, equivalent to 40 million litres of milk annually. Speaking at the plant’s opening ceremony, Vinamilk General Director Mai Kiều Liên said her company wishes to help the domestic dairy industry develop into a hi-tech agricultural industry in Việt Nam and Asia. Vinamilk also strives to bring the quality of the local dairy sector closer to those in the developed world, Liên said. 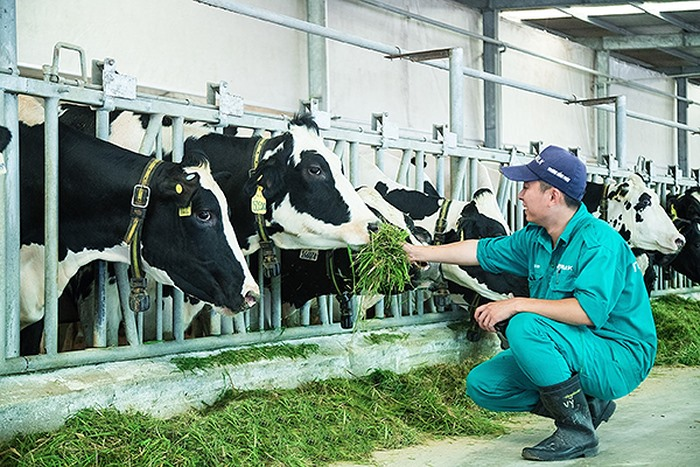 In 2018, Vinamilk launched a high-tech dairy farm in central Thanh Hóa Province. Built with an investment of VNĐ700 billion, the 40ha farm has the capacity to hold a population of 4,000 milking cows. The farm is the first of its kind to be built in the Vinamilk Thanh Hoa dairy farm complex, which is designed to have four high-tech farms with a combined milk supply of 110 million litres per year by 2020. Vinamilk recorded a total of VNĐ52.56 trillion in net revenue in 2018, up 3 per cent year on year. However, its post-tax profit slid to VNĐ10.2 trillion from VNĐ10.3 trillion in 2017.